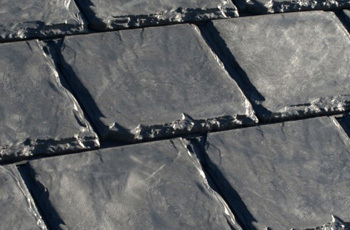 If you love the look of thick, rough-chiseled slate, check out EuroSlate. Even though it costs significantly less, it is more durable, as light as asphalt tiles, and absolutely will not crack. Staying true to the company’s environmental mission, these rubber tiles contain up to 95 percent post-consumer recycled materials. Installation is significantly faster and easier than almost any traditional tile. The three-foot panels lock in and provide a weatherproof, windproof seal. Available colors include black, grey, and redwood. And unlike other products, colors won’t fade. Why choose Euroslate over stone? Slate roofs are expensive. The tiles are pricey, and the installation process is long and tedious. There are very few roofers that are experts at installing slate properly. And, slate is very heavy. Most often, extra support must be added to a roof prior to installation. Rubber delivers the beauty, longevity, and weather and mold resistance of slate for a fraction of the cost. And, you’ll be doing good for the environment when you choose a Euroslate Rubber Roof. The only way to make sure that your new roof will be installed to the specifications required to maintain its warranty is to work with a certified contractor. We are one of only a few certified roofers in Alberta. You can rest assured that as certified professionals, we are paying close attention to everything from structural load requirements to proper eave protection. Give us a call to learn more. Our professionals are here to answer all of your questions about all of our roofing material options. We’re certified and licensed to install any kind of roof. We’ll help you make the right choice for your home. And thanks to our commitment to craftsmanship, attention to detail, and outstanding customer service, you’ll be thrilled with your new roof.